You are currently browsing the tag archive for the ‘childrens’ tag. 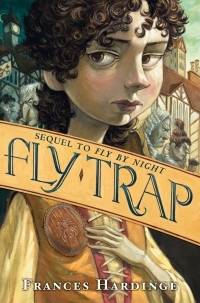 So after Narnia, I picked up another children/young adult fantasy – Fly Trap (Twilight Robbery in the UK) – and it was such a palate cleanser! 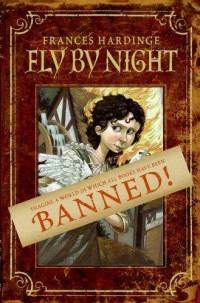 I loved Frances Hardinge’s first in the series, Fly by Night, and this one was even better. I’d also argue it can be read a stand-alone. It’s set right after Fly by Night, when the 12-year-old heroine Mosca Mye, her travel companion Eponymous Clent and Saracen, the goose, are looking for greener pastures after (accidentally) triggering a revolution. They end up in Toll, an apparently perfect town… until night falls. Without giving too much away, in Hardinge’s world words and names have power. Each person is named according to the Saint (or Beloved) responsible for their birth day, but in Toll this has serious consequences. In Toll, all Beloveds have been divided into the bright, good ones and the villainous, dark ones. If you’re born under the right Beloved you’re allowed to live in Toll-by-Day, where life is well-organized and comfortable. Otherwise you’re banished to Toll-by-Night and for all intents and purposes you no longer exist. Mosca you see, was born under Beloved Palpitattle, He Who Keeps Flies out of Jams and Butter Churns. According to tradition, Palpitattle children are “judged to be villainous, verminous, and everywhere that they’re not wanted”. Part of the plot is about how Toll go into such a society, and the rest is how Mosca deals with her status and her attempts to challenge it. And thus, once again our nomad trio find themselves entangled in new schemes and winding politics. A great read overall and I agree with Teresa 100%: it’d make the perfect Miyazaki movie! You guys, shame on you! What conspiracy is this? How come I’m only finding out about Shel Silverstein now? Everyone on the internet seems to have a memory associated with his poems and stories and I only heard of him because of Amy’s comment on my previous post (I’m not American, so I guess that might have something to do with it). After Amy’s recommendation I got curious and the samples I found online hooked me so much that I immediately ordered his three poetry books: Falling Up, Where the Sidewalk Ends and A Light in the Attic. All three are wonderful and perfectly capture what I remember about being a kid: the slightly gross and wacky humor, the rebellion combined with pure tenderness, the uncontrolled imagination. They are the perfect read-aloud material, not only for the poems but also for Silverstein’s own illustrations, which often add something to the meaning of the text. I’m only sorry his play on words must be really hard to translate, which limit his audience. Don’t you just get a little knot in your throat reading this? I can’t wait for David to be big enough for me to read it to him. 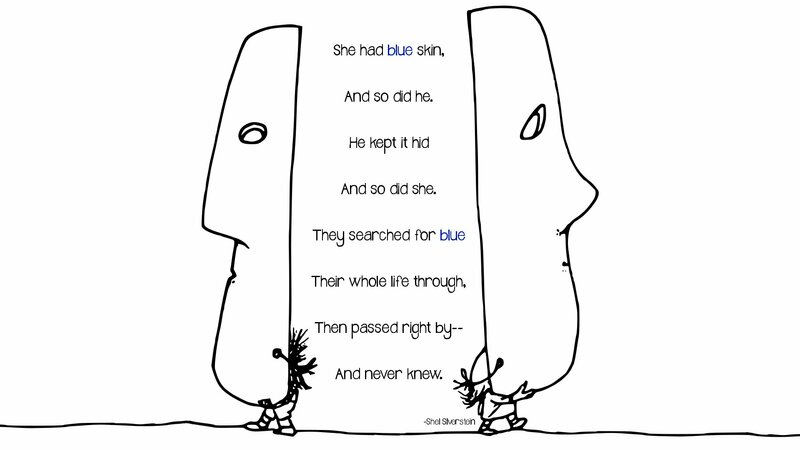 Some poems have subtle lessons that will also be fun to explore with little D. What will he make of this (and the one with the masks below)? So only the biggest fish gets fat. Do you know any folks like that? I don’t usually go for surreal poetry or literature (really didn’t get into Alice in Wonderland, for instance), but there was something about Silverstein’s writing that hit a cord. He created characters who eat the universe, who write poetry from inside a lion, who invent a light that plugs the sun and a boy who watched so much TV he turned into one. The kind of stuff a child would actually come up with, so t’s a real gift for an adult to pull that off. 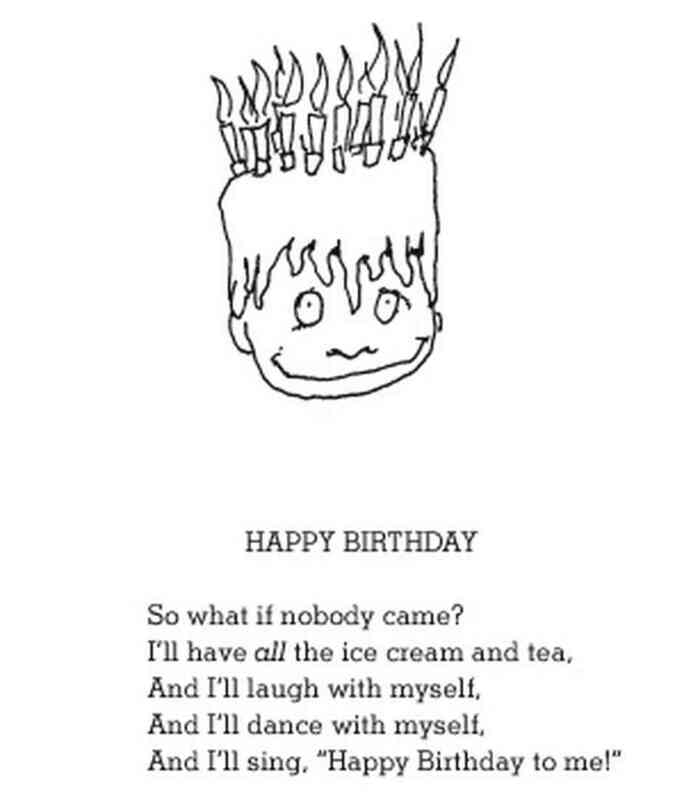 Shel Silverstein’s books are often challenged and banned exactly because of this tongue-in-cheek humor. 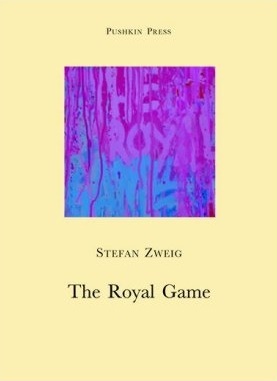 There is also an undeniable leftish, anti-system, free-thinking, rebellious vibe to his work. One poem instructs kids to kill themselves so that parents will feel guilty about not doing what they want, another called “MA AND GOD” ends with “Either Ma’s wrong or else God is”. It does teach defiance and questioning dogmas, but I suspect the parents who get offended may have forgotten what it’s like being a kid. Thanks once again Amy for the tip. I’m sure these books will become a family tradition. With a quirky style evocative of Lemony Snicket, and unexpected Jane Eyre elements, The Incorrigible Children of Ashton Place is about a young governess and her three er… unusual pupils. Wanted Immediately: energetic Governess for Three Lively Children Knowledge of French, Latin, History, Etiquette, Drawing, and Music will be Required – Experience with Animals Strongly Preferred. 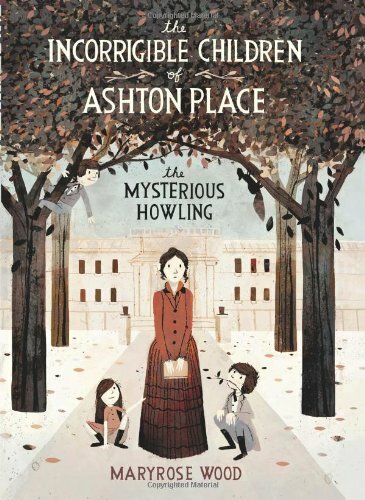 At Ashton Place she discovers the three children were found in the woods by Lord Ashton (an avid hunter), and had been raised by wolves. But Penelope is an optimist, and it takes more than wolf-children (or having to teach them schottische for a Christmas Party) to discourage her. It’s a short book, with several of characters, but Wood give us enough to make each distinguishable and memorable. 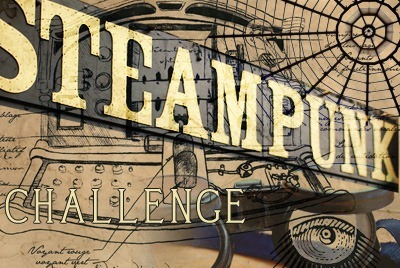 I found Penelope particularly likable, with her no-nonsense and practical approach to challenges. The Incorrigible Children is funny, endearing, intriguing, and any book lover will revel in the clever references to Dickens, Longfellow and other literary personalities. I just can’t help but wish it wasn’t part of a series. I wish it would be a stand-alone little pearl of a book, enough in itself. My bookclub was discussing the depthness of good children’s books, so we decided to leave our comfort zone and try The Butterfly Lion. 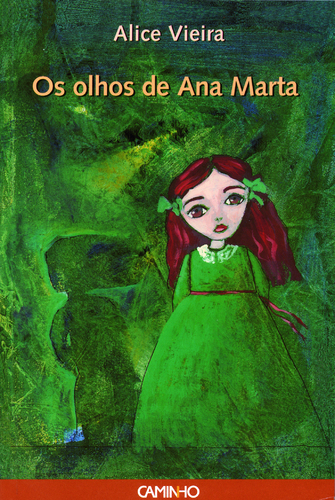 It’s a very short book, around 180 pages, and indeed, we quickly jumped from one topic to another, from the constant removal of parents in children’s books (Mary Poppins, Narnia, Harry Potter), to the art of taming lions or the legality of burying people outside cemeteries in different countries. 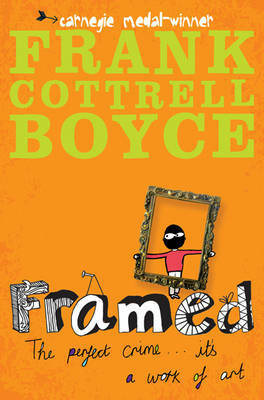 The story is about Bertie, who grew up in an isolated farm in Africa. There he rescues an orphaned white lion cub, who becomes his best friend until Bertie turns eleven and is sent to school in England. The lion is sold to the owner of a French circus, who promises to take good care of it, but Bertie vows that they will meet again. 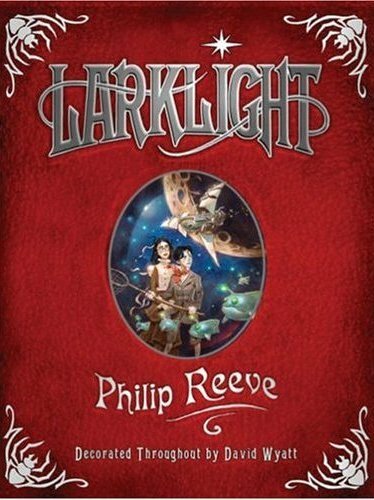 It’s a perfect book to discuss in a class of 7-12 year-old, and will enter my especial list of Recommendations For Boys Who Don’t Like Reading: there are lions, a circus, a War and vivid descriptions of exotic African landscapes. 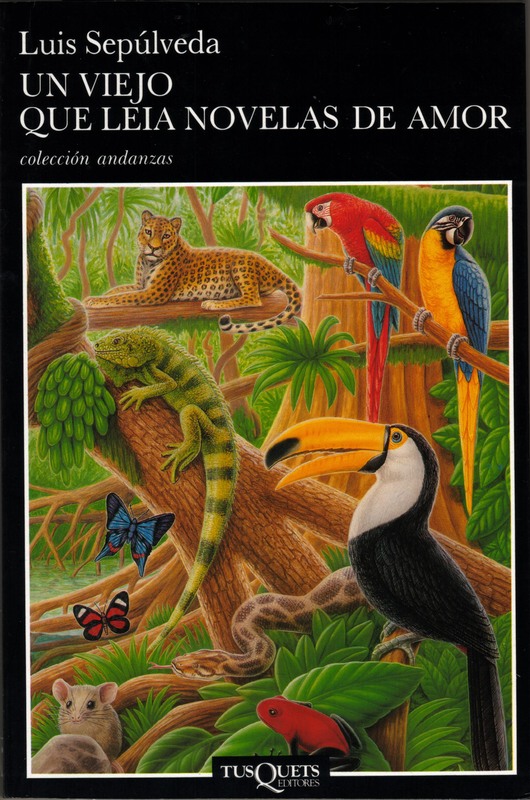 But what makes The Butterfly Lion stand out from other children’s book is the melancholy that seeps through. 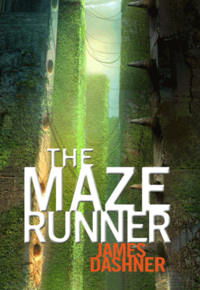 There’s this bitter-sweet feel to the book that grabbed me immediately (à la Up), and made me prepare for an unhappy ending that never materializes… or does it? I don’t usually deal with kids at work or socially, so I wonder what they’d make of the book or of the big twist in the end. Do they (even if intuitively) feel the sadness and longing, or do they get caught in the adventure of it all? 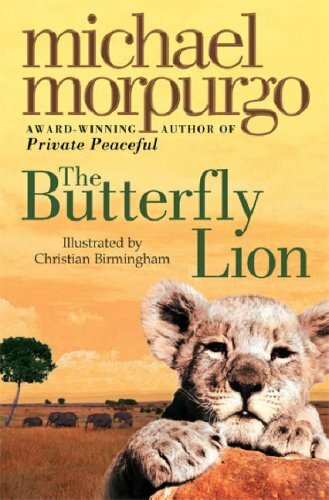 The Butterfly Lion is wonderfully written and for the first time it made me curious to pick up Morpurgo’s other famous book, War Horse. I’ve heard it in audiobook, spotlessly narrated by Virginia McKenna and Michael Morpurgo himself. Can any book be more quintessentially English than The Wind in the Willows? 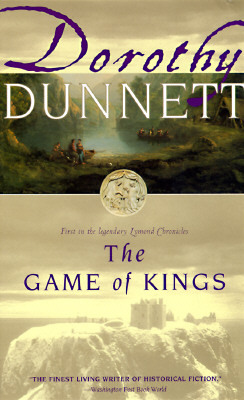 I blame it for my early stages of Anglophilia, but I’ve only very recently realize it was originally a book. I knew it first through the Thames Productions adaptation. I have fond memories of not only the show, but also, strangely, of Thames’ intro. When it came up you knew you were in for a treat, and although I know it was also the intro to other shows, in my memory it’s forever attached to The Wind in the Willows. Ah to be a kid in the 80s in Portugal! I’ve no idea why, but on top of the ones dubbed in Portuguese, we got a huge mix of cartoons dubbed in other languages (originals were usually Japanese) and then subtitled in Portuguese. I can still sing parts of the generic of Alice im Wunderland and Ferdy the Ant in German, Les Mystérieuses Cités d’Or in French, Captain Planet (We‘re the Planeteers, you can be one to!) in English and Boes Boes in Dutch. Others were left in their original language and only subititled, like the soccer cartoon Tsubasa (Japanese – do you remember the Japan vs. Brasil game? A classic!) and The Tale of Tsar Saltan (Russian). But I digress. The Wind in the Willows was very different from I was expecting. The biggest surprise was that Grahame alternates the adventures of Toad, Mr. Badger, Ratty and Mole with slower chapters that, although still involving the characters, are more lyrical and focused on things like love of home, friendship and the wonder of small things. In theory, these changes in mood could become contrived, but Grahame does it so naturally that you can’t help feeling that all works wonderfully. It was a great and beautiful discovery, these thoughtful and happy sections. More nostalgia-happy than puppy-happy, and some parts got me all teary. My favorite moment was when Mole, who had lived with Ratty a long time and was having too much fun to notice time fly, noticed a familiar smell while walking in the forest. The smell of his long-forgotten home. Shabby indeed, and small and poorly furnished, and yet his, the home he had made for himself, the home he had been so happy to get back to after his day’s work. And the home had been happy with him, too, evidently, and was missing him, and wanted him back, and was telling him so, through his nose, sorrowfully, reproachfully, but with no bitterness or anger; only with plaintive reminder that it was there, and wanted him. Also loved the descriptions of food, in particular of Mr. Badger’s winter storage. Could his home be a better safe haven, especially after you were lost in a cold, unknown and dark forest? Grahame’s descriptions of domestic bliss can only compete with those by Mrs. Gaskell. Rows of spotless plates winked from the shelves of the dresser at the far end of the room, and from the rafters overhead hung hams, bundles of dried herbs, nets of onions, and baskets of eggs. It seemed a place where heroes could fitly feast after victory, where weary harvesters could line up in scores along the table and keep their Harvest Home with mirth and song, or where two or three friends of simple tastes could sit about as they pleased and eat and smoke and talk in comfort and contentment. The Water Rat was restless, and he did not exactly know why. I read this in a tattered second-hand copy but want to get a beautifully illustrated edition for my collection, to read to any future children. Most bloggers have difficulties in writing reviews of books they really loved, but I find the “ok” ones much more challenging. The Amulet of Samarkand is a good example. I had fun with most of it, at points wished the story would go faster, didn’t feel particularly attached to any character and its biggest lasting impression is that after Googling Samarkand I’m set on visiting it. The story is about Nathaniel, an apprentice magician that is clearly more talented than his mediocre master. When his master doesn’t protect him from undeserved humiliation at the hands of one of Britain’s greatest magicians, Nathaniel vows revenge. This alternative Britain is set in the present time, but somehow I kept imagining it in a typical fantasy landscape, with horse and castles. There are fun foot-notes that give you extra insight into this world and show that the author did his homework. 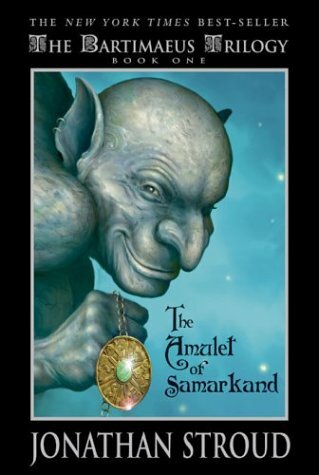 Because of them I can’t help thinking of The Amulet of Samarkand as a Jonathan Strange and Mr. Norris for children. 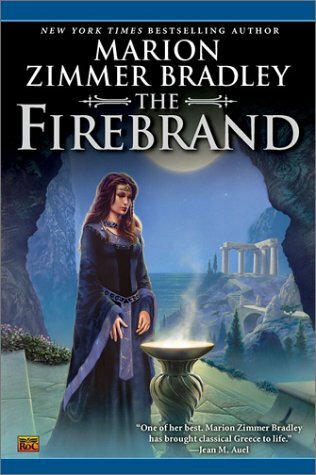 The book’s highlight is by far Bartimaeus, the daemon Nathaniel summons to help him in his quest. He is hilarious, with just the type of sarcasm and aloofness you’d expect from a 5,000-year-old djinni that’s forced to serve a 10-year-old. I’ll mentally file this book under “Books I Wish I’d Read When I Was 12″. According to Wikipedia, Miramax is preparing an adaptation, directed by John Philip Madden (Shakespeare in Love, Proof) and written by Hossein Amini (who did a great job with The Wings of the Dove). Overall very promising!